It has been a long while since that first almost-sweater. 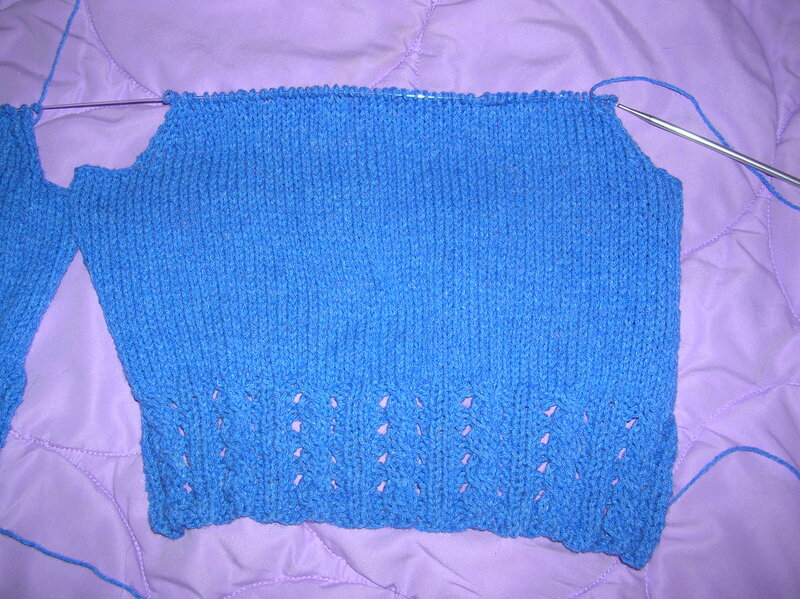 These days I am finishing a second v-neck sweater. I call it my “tornado” sweater since I started it back in April when the power was out from the tornadoes that hit a community two miles from where I lived at the time. 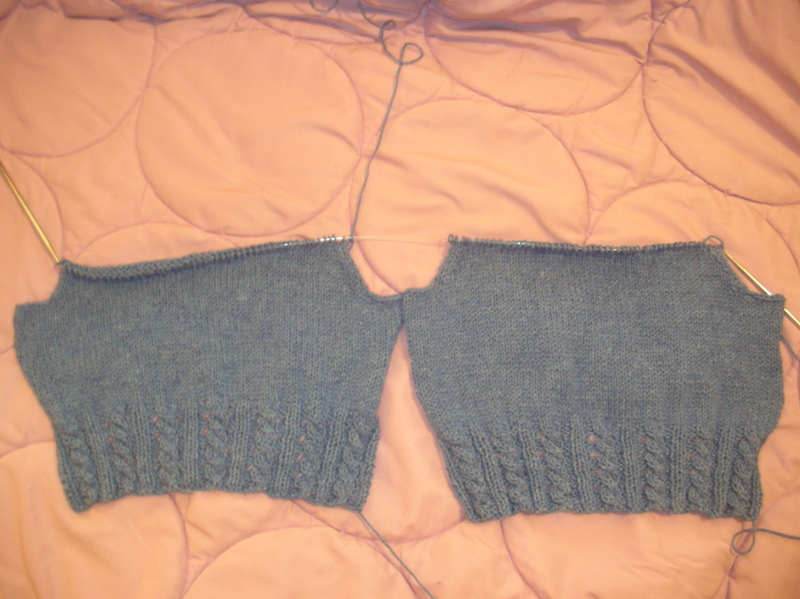 The back andthe front are finished and the sleeves are being knitted at the same times on circular needles. 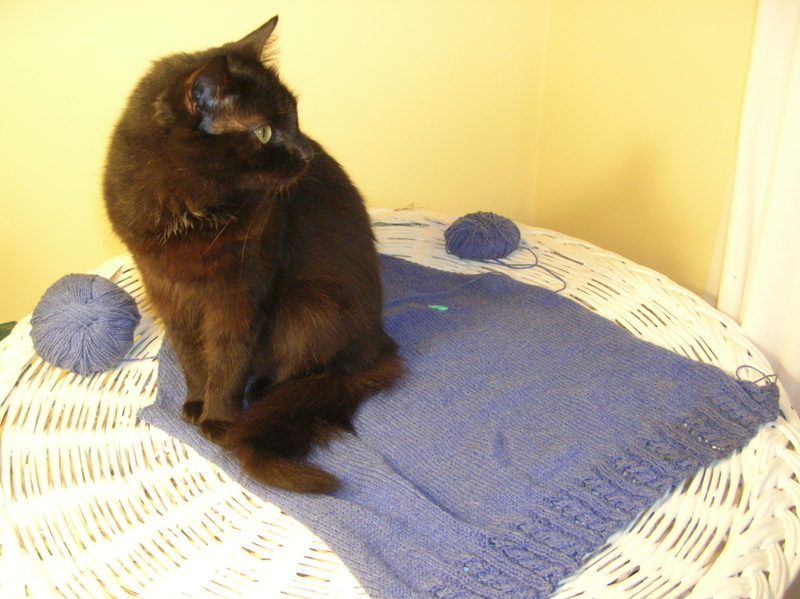 This ‘double’ knitting is great in that when I finish a sleeve, they are both finished! Coco sitting on the back of the sweater. This photo was taken at the same time as the one above but with a different exposure. I would love to complete the sweater in time to wear to a wedding this Saturday but it is a wool blend and the wedding is in downtown Chattanooga, in the middle of July, no less. Maybe not. I may wear the first v-neck sweater I finished earlier this summer a combination of linen and cotton, perfect for a hot, humid Southern afternoon. Thanks for visiting my blog. When I get my machine out of the rental storage unit (we moved in June) I’m going to start sewing again. Thank you ever so much for your book suggestion on Kate’s needled blog re pdd. It is indeed a matter of hanging in there, the main problem for me is insomnia. I will be starting some cognitive therapy very soon – waiting for date – and am hopeful. Lovely to have found your blog this way, too! Off to update on Ravelry. This post reminded me of my aunt who taught me how to crochet and the many blankets of hers that I still have and use today. She’s always surprised at her own work because she’s forgotten how many people have her blankets as gifts. This also takes me back to my sister teaching me many years later how to knit. I still get frustrated with patterns in either style and end up free-styling. Your cat Monkee, looks just like my girl Kai, down to the placement of the white fur patches. Thanks for visiting. I’ve always thought Monkee looked as if she has on a bikini. A piece of erudition ulinke any other!